Spec-D Tuning 12V Racing Car RED LED Ignition Switch Panel Spec-D Tuning 12V Racing Car RED LED Ignition Switch Panel, Spec-D ESB-CF1008 Start Panel, Spec-D Universal Ignition Switch Panel, Universal Ignition Switch Panel, Spec-D 12V Universal Ignition Switch Panel, 12V Universal Ignition Switch Panel, Spec-D 12V [Spec-D ESB-CF1008 Start Panel] - $39.95 : 3rd Strike Performance, Your Source for Late Model MOPAR Performance Parts and Accessories! Brand new in original packaging. Exactly the same as shown in the picture! 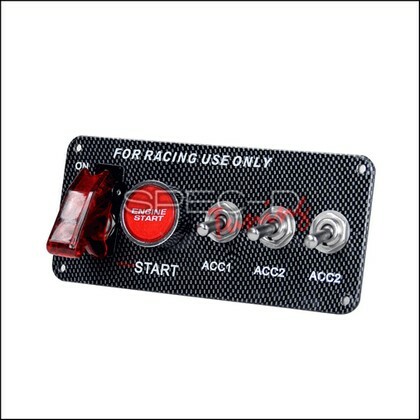 Comes 1 set of engine start switch toggle panel. Carbon fiber style panel. Red LED illuminate on/off switch and start button for better visibility when start. Dimension: 5.9" x 2.56". This kit comes with switch toggle panel, switch, wiring, relay and screws. To gives your vehicle a sporty racing style. Installation instruction does NOT included. Professional installation is highly recommended. Fitment : Fits for most cars with 12V.